Theres this place in Winlock Washington called Brensons Hoolow,the story is that there was a group of towns people back in the time of the Great Depression. One of the founding families there last name was Snow, they all caught small pox, at the time the only thing they thought that would get rid of small pox was by burning down the village. So the snow family boarded up there house and burned it. everybody ended up dying of course. When you walk past the gate its a scary feeling, you look on the other side of the gate and it can be sunny on your side of the gate it lookis like its going to pour, if you go near where the house use to be you can hear a swing set and children laughing. I have heard you can hear people screaming like there in pain. and sometime you can see eyes in the woods and there not animals, normally when you go near an animal they normally will run away but this never did it just kept moving. it was very creepy.I have heard that some people will try to leve and there car batteries are disconnected. 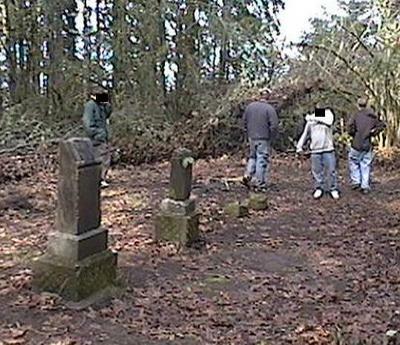 The snow family were buried there and they moved there bodies because people were vandalizing there grave sites. I would recommend people to go and experience it yourself. bring extra flashlights because when i went i had a full battery in mine and it went out something or someone drained the battery, and so i had to use my phone and that battery got drained. I've been there many times. The bodies were never relocated. As a matter if fact the most recent body to be buried there was in 2007. It doesn't seem a bit creepy to me. Everyone seems to think this place is haunted and extremely scary but i did not feel that way at all. It seemed as if there may have been someone there that's for sure, as for the weather i can agree with that but nothing to strange. It was a very heavy and sad place.